A pregnant Illinois school psychologist braves a tornado’s wrath while searching for a city councilman’s killer. Only a few days before the start of school, Skye Denison-Boyd is scrambling to set up the year’s testing, counseling, and intern supervision ahead of her upcoming maternity leave. But Mother Nature turns out to be the ultimate decision-maker, dealing Scumble River a blow that knocks the roofs off all three school buildings and levels much of the property. The home Skye shares with her husband, police chief Wally Boyd, is in ruins. Fortunately, Wally’s father, multimillionaire Carson Boyd, is able to send the couple a deluxe mobile home in which to await the arrival of their firstborn. But Wally can’t stay home while a town full of dispossessed homeowners struggle. Zeke Lyons’ wife is darn near beside herself because her husband may still be in their house, where he stayed to care for their dog through the storm. Wally finds Zeke’s body in the bathroom, but the burn marks on his corpse suggest it wasn’t the twister that did the councilman in. Wally’s just starting to investigate when Mayor Dante Leofanti sends him to check on his friend Hollister Brooks’ tenants. Wally heads for Brooks’ old farmhouse east of town and promptly drops off the radar. Now it’s up to Skye, with help from Carson, to track down Zeke’s killer in hopes of finding her missing spouse. 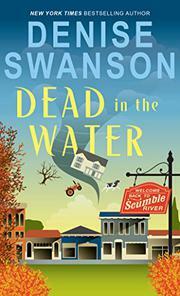 Swanson relaunches her Scumble River series (Murder of a Cranky Catnapper, 2016, etc.) under the flag Welcome Back to Scumble River. But her stories are just too earnest, as well as too formulaic, to stay afloat long.